Back row(from left to right): Bill Lovenberg, Mike Kane, Gregg Riech, Mark Tolbert, David Montroni, Steve Emanuel, Steve Schreier, Steve Ciangetti, Sean McTiernan. Front row: Dawn Blessing, Mike Westman, Diane Holzmiller, Jason Dougherty, Caitlin Szymanski, Aundrea Munt, Brandon Tolbert, Christine Nardi, Angie Roche. To quote Joan Tredy, Friday night, January 5th was "a wonderful celebration of community spirit and love." 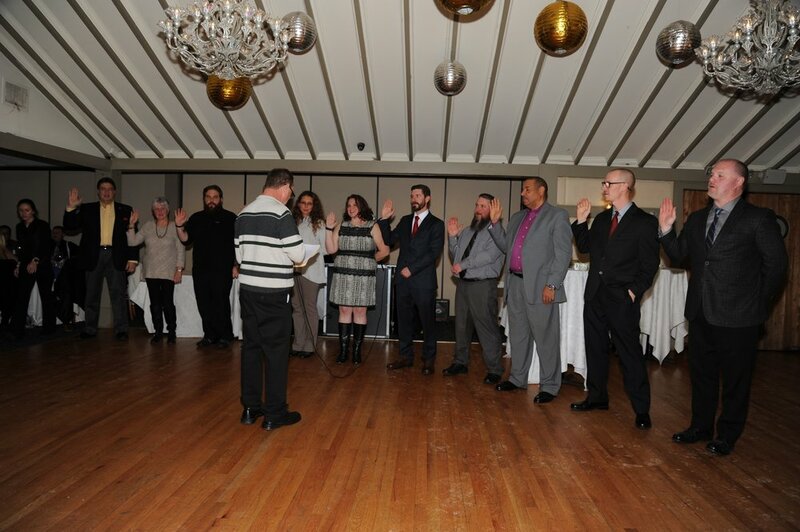 On this night, squad 42 held their annual installation dinner. While it's an annual tradition, every year it's a celebration of the accomplishments of the year prior, and a look forward to the year ahead. We get to spend time with some old friends, and shake hands with many new ones. As our squad grows, so does our capability and pride. It is with heads held high, that we herald in the new year and look forward to more time spent serving our community and developing ourselves. The night begun with a prayer led by our Chaplain, David Montroni. Captain Mike Kane, with a little help from President Angie Roche, began the night by honoring all of the agencies in our town and surrounding, that have been there to assist us this year. Lacey EMS provided mutual aid during our dinner and through the rest of the night. To thank them for their service, Mike attempted to go to Applebee's to provide gift cards to the crew so they could enjoy a nice dinner as well. Applebee's took the matter into their own hands and provided the meals at no cost. For that, we are very grateful. Plaques were awarded to Barnegat First Aid Squad (Not in attendance) and Lacey EMS. A plaque was also awarded to the Ocean Township Police Department for their valuable assistance on every medical call. In attendance to receive the award was Police Chief Michael Rogalski. The Waretown Volunteer Fire Company also received an award, the key to our station. This symbolizes the bond that we have as fellow first responders, as we continue to work together on a common goal, ensuring the safety of our community. 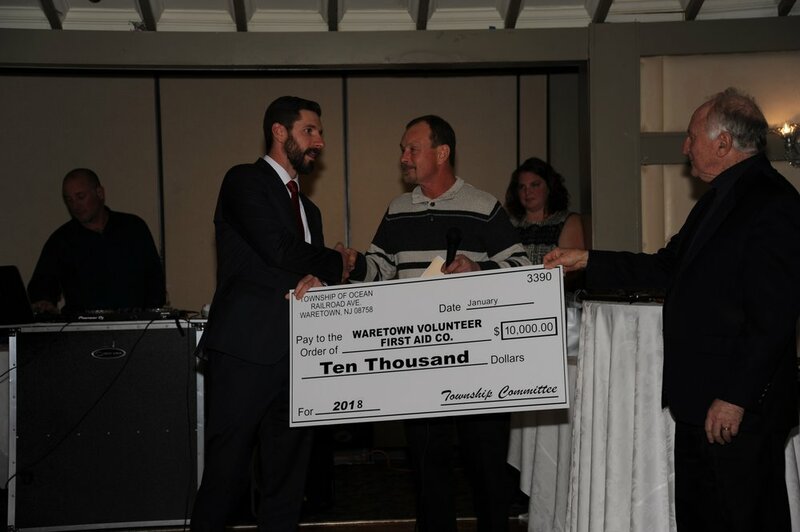 The Waretown First Aid Auxiliary honored us with a donation of monitors for our CPR training dummies and a $1,000 cash donation, for a total of $4,900. They also generously provided gift bags for each member of the squad. 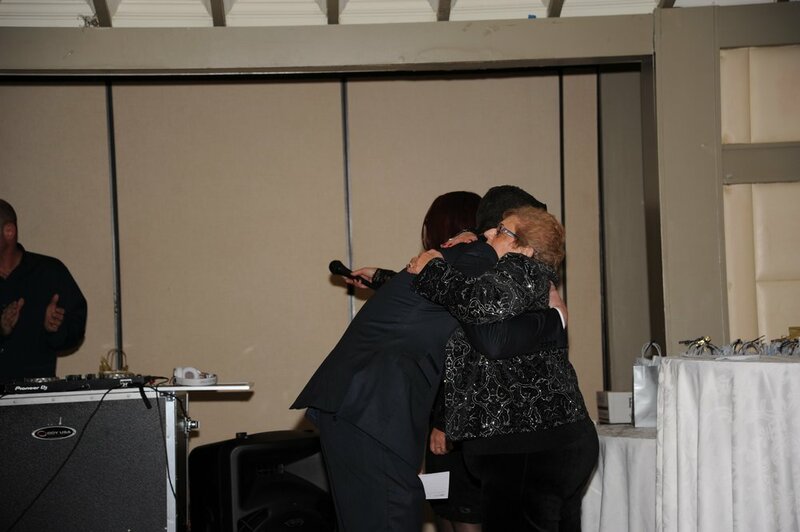 The wife of former mayor, the late Dennis Tredy, honored us with her attendance and presented us with a donation of $1,000 in memory of her husband. Mayor Dan Collamer and Committeeman Ken Baulderstone presented the squad with a $10,000 donation. Left: Capt. Mike Kane. Center: Gina Schreier. Right: Joan Tredy. Left: Capt. Mike Kane. Center: Mayor Dan Collamer. Right: Committeeman Ken Baulderstone. Awards given to squad members included Top Callers Steve Emanuel, Brandon Tolbert and Jason Dougherty for running 115, 152 and 216 calls respectively. 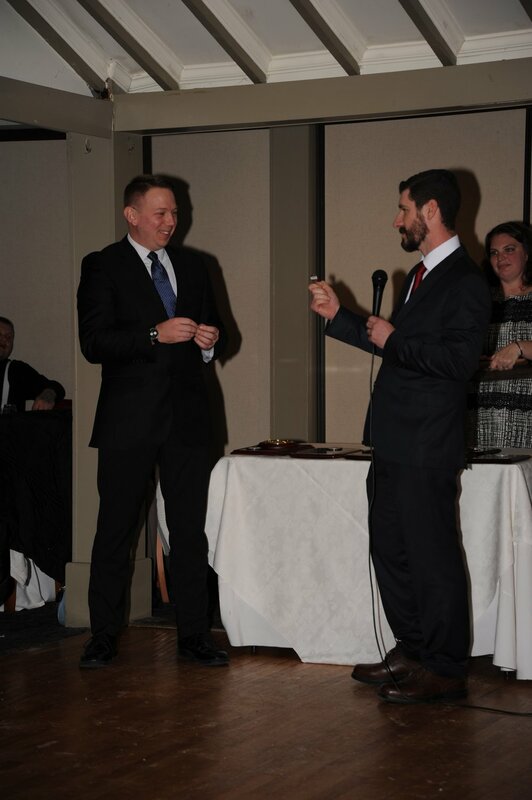 A Captains Award was given to our current Vice President, Scott Carter, for his continuous hard work behind the scenes training and developing our EMT's. His award was accepted by his daughter. From left to right: David Montroni, Diane Holzmiller, Steve Ciangetti, Mark Tolbert (Behind Dan), Aundrea Munt, Angie Roche, Mike Kane, Mike Westman, Steve Emanuel, Brandon Tolbert, Gregg Rieck. Center: Mayor Dan Collamer. At the end of the night, various door prizes were awarded. These prizes were generously donated by Petty Motorworks, The Brunch Spot, Kristy's Casual Dining and Black Eyed Susan's. Additional donations were provided by Shoprite of Waretown, Waretown Oaks and Mastercraft. Congratulations to all of our officers! We also owe our gratitude to our photographer and the Captains Inn for hosting us. We look forward to another great year of growth, community service and camaraderie in 2018. Newer PostWho ya gonna call, ER or Urgent Care?